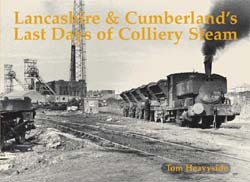 A nicely composed collection of early 1970s photographs taken by the author neatly chronicles the final days of steam powered locomotion at collieries in Cumberland and Lancashire. The nostalgic photos are accompanied by detailed captions identifying each of the locomotives and giving an account of their smoke-filled lives. The locations are mainly in the areas surrounding Whitehaven, Leigh and Wigan and the collieries featured include Haig Colliery, Bickershaw Colliery, Lowca, Harrington, Ladysmith, Walkden, Astley Green and Bedford.